Community Gardens Day on June 17 was the best in our five year history! The weather was spectacular, as we celebrated summer’s arrival across the city at 60 vibrant and unique community gardens and shared open spaces. The walking, biking and trolley tours in partnerships with the Sierra Club and Mural Arts Philadelphia had a great number of participants who got explore gardens in South and West Philly. At the Community Gardens Day Celebration at the Community Gardens at Ralph Brooks Park Mad Beatz kicked of the morning with a drumline and the incredible lineup of speakers painted the big picture of community gardening in our region. 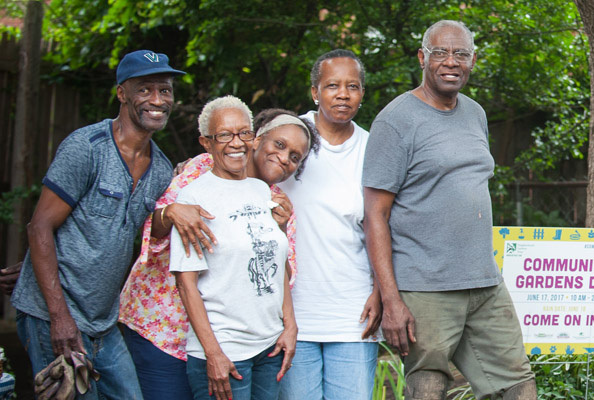 For the first time we recognized Community Gardens Day Heroes, for their work in supporting and preserving community gardens in the Point Breeze neighborhood. One honoree was former Philadelphia Eagle, Connor Barwin for the effort for his Make the World Better Foundation. A special thanks to all the gardeners, sponsors, partners and NGT board members who helped make this day a huge success! Check back for details about Community Gardens Day 2019 this winter!